Some days you wake up in the morning with the taste of a meal in your dreams and wonder whatever happened to that dish or that meal. 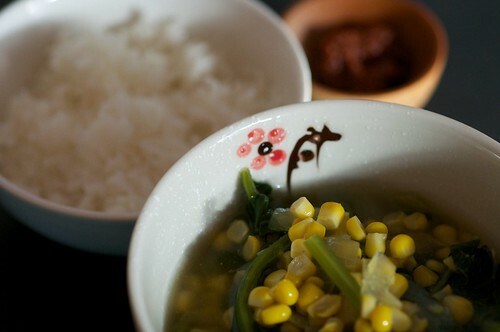 For me, it was the sweetness of the corn and the satisfying spinach crunch that I remembered in this very simple soup. Unlike other Indonesian dishes, it’s unlikely you find this listed in a restaurant menu next to satay or Gado Gaddo. This is the type of dish that people cook as their weekday staple over rice with a side dish of tempe and house made sambal. Call it the dish that you have to grow up with and know about. For whatever reason my mum stopped cooking this dish when we moved to Australia and it was only lately that I remembered it. 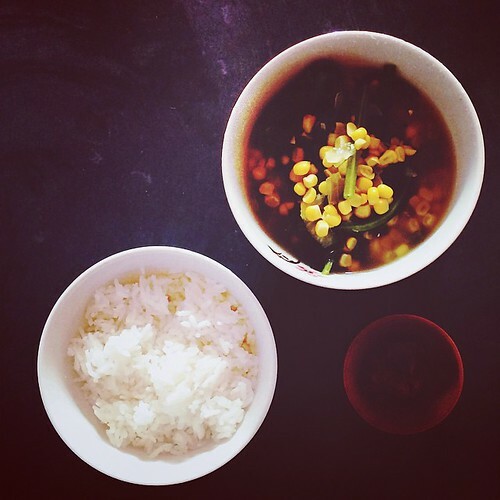 It might be the constant rain and the humidity lately that brought on the the memory of eating together around our old wooden dining table watching this soup being ladled over rice. If you are looking for an easy and quick recipe, this is the one that I will be adding to my weekly staple. Hopefully it brings you a bit of comfort too in this crazy world where Sydney is at a stand still while the rest of the world watches. Put the stock, onion, galangal, garlic, turmeric bay lead and brown sugar in a large pan and simmer for 5 minutes, covered. Add the corn and simmer for 7 minutes, partially covered, until the corn is tender. Add the spinach and season with salt to taste. Serve with rice and sambal.